Wales contributed four gold medals to Great Britain's haul of 13 at the IPC Athletics World Championships - and now focus turns to next year's Rio Paralympics. The 48-strong team won a total of 32 medals in Doha, surpassing the 10-12 golds and 26-30 medal target set for them before the competition. 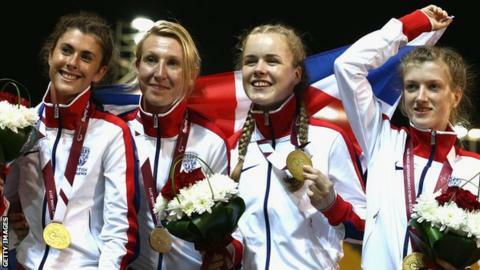 British Paralympics head coach Paula Dunn said the team "expect success" as she reflected on her team's efforts in Doha. And as attention turns to the 2016 Paralympics in Rio, the Welsh gold medallists are hopeful of adding to their haul. Welsh sprinter Olivia Breen was among the final-day gold medallists in Doha, helping the women's 4x100m T35-38 relay team storm to victory. Breen, Maria Lyle, Georgie Hermitage and Sophie Hahn set a world record of 52.22 seconds to beat Russia (53.18) into second. Breen, originally from Guildford, won a bronze medal in the same event at the 2012 Paralympics in London. Now the 19-year-old is hoping to replicate her Doha form in Brazil next year. "I'm over the moon," Breen said after winning gold. "We've broken the record and hopefully we can get an even better world record next year." Another gold medallist in Doha with experience of competing at the London Paralympics is Aled Sion Davies. The 24-year-old from Bridgend won discus gold and bronze in the shot put in 2012, and triumphed in both at the 2013 World Championships in Lyon. He then repeated the feat in Doha as, after winning gold in the F42 shot put, Davies won the F42 discus, throwing a world record 49.59m. The discus event will not be part of Rio 2016 but for Davies, who had hernia surgery 10 weeks ago, two gold medals was a fine return. "I've delivered on that big stage again," he said. "I wanted to get over 50m but this is probably the most consistent series of throws I have ever had in competition. "The medical team have worked really hard to get me here and I have to thank them." Like Davies, F46 javelin thrower Hollie Arnold successfully defended her World Championships title in Doha. The 21-year-old, who lives and trains in Cardiff, set a new personal best and championship record of 40.53 metres. "I just wanted to break that world record, but Rio needs to get ready for me because I'm coming," she said. "It's always been in my sights and I'm a bit more hungry and I really want to get a Paralympic gold medal. "I've never been to a Paralympics and won a major medal, so that's definitely my aim."